Built myself a 6m dipole using a dipole center and some of the hamfest wire I picked up back in February. As it’s also Towel Day, I had mine handy just in case. 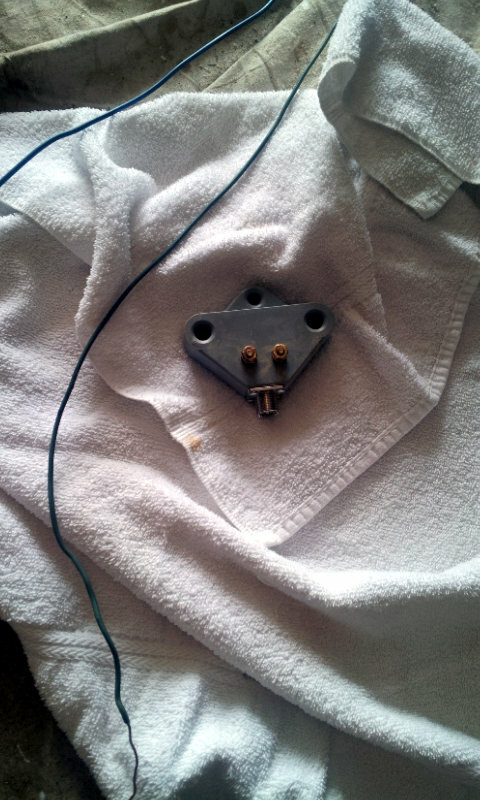 I wanted my antenna to be resonant at 51 MHz. Using l = 149.35/f 1 gave me a length of 2.96m, so I cut a 3m length of wire and then cut that in half. I soldered some stranded wire to one end of each wire to connect to the dipole center and attached a couple of ceramic insulators to the end. One end got tied off against the house and the other end to my PVC mast propped up against a ladder. The first look with my antenna analyzer showed the antenna resonating around 49.3 MHz with an SWR of 1.0 (wires a bit on the long side). A bit of math (49.3MHz/51MHz = 0.97) told me the antenna needed to be 2.9m long (3.0 * 0.97) so I trimmed 5 cm off each end and got 1.0 SWR right at 51 MHz. With the dipole connected to the radio, the receive is definitely louder than the ZS6BKW on 6m. I wasn’t able to pick up any other stations, but there was a lot of electronic noise. In the fldigi waterfall, there were lots of periodically spaced vertical lines all across the band. I’ll have to give a listen later when it cools down a bit and people turn off their AC units. Maybe it’ll get better then. At 2.9m long, it’s small enough to be very easily portable. I’ll need to get a much shorter length of coax to use with it to minimize losses (it’s connected to the radio using about 23m of coax) and something to hold it up in the air. Could be neat to carry this around and break it out when a 6m opening pops up. 1. 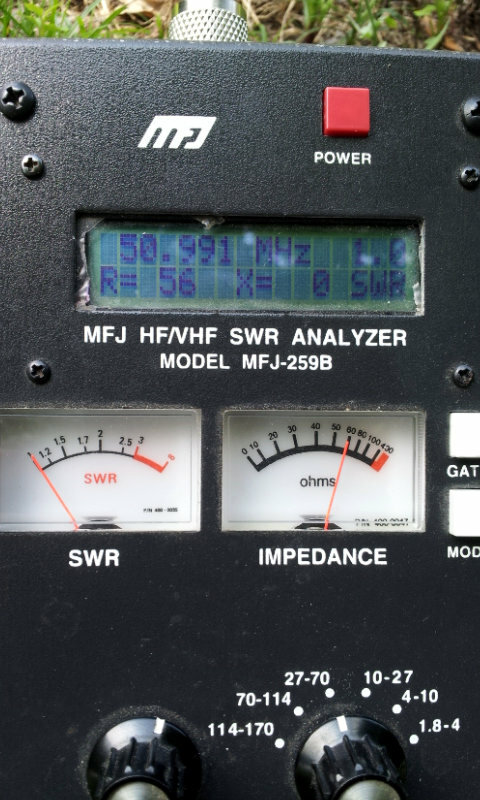 Take l = 490/f, which gives you the length in feet when f is in MHz, and multiply by 0.3048 to convert to meters. Metric is how I roll.